If Outlaw Americana is a genre then this album is that. An original blend of southern rock, country, Americana, and just darn good music, 4GR's second album delivers a fist full of it all. The members of 4 Gun Ridge have deep roots in Hudson Valley music. After leaving the days or their heavier bands, Joey's Throwin Elbows and Mearth behind, Donny Parker and Ian T. Fuller got the itch to start the edgy country project they had talked about for years. The early stages of 4GR started with acoustic jams in 2009. Informal porch picking turned into focused writing as an original sound emerged. Old songs and ideas the boys had been sitting on for years came together quickly. Before too long they stepped it up a notch with the addition of another rock and roller Duke LeBlanc on bass and Brother Adam Schreiner on drums. Fronted by Donny and his Gibson acoustic, 4 Gun Ridge plays original gritty cowboy rock the way you like it. The old time outlaw country influence is obvious but, they never shook off their dirty rock roots. Imagine upbeat southern rock played by upstate NY blue collar boys. Good tunes and good times. The outlaw and pre-pop era country influences that were evident on 4GR's self-titled debut album are visible in 4GR's live sets and online videos. 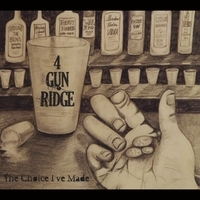 4GR's second album, The Choice I've Made, represents the growth of the band as a cohesive and rocking unit. The band remains very active in the Hudson Valley music scene and continues to put on killer sets at festivals, bars, NYC gigs, music venues, parties, and wherever original music is appreciated.